How many equal-sized polygons can be used to cover a soccer ball? It seems that mostly either 26 or 32 equal-size polygons are used to cover a spherical soccer ball. What other configurations are possible? There are an infinite number of ways to cover a soccer ball, if you're allowed to use "biangles", polygons with two sides and two vertices. Draw a line from the ball's north pole to its south pole. Repeat this process any number of times. 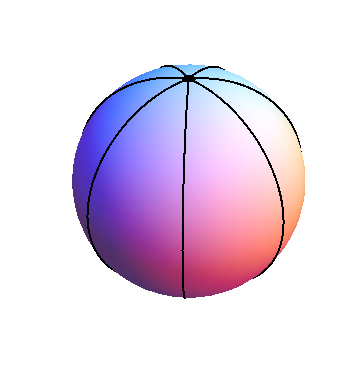 Now you have a "beach ball" pattern, with however many slices you desire, all of equal size. If you don't allow biangles, but you do allow non-regular polygons, take the above pattern and draw a line around the equator; now you have any number of 90-90-?? triangles. Most of the possible solutions would be found in the collection of Platonic or Archimedean solids. In that case the options are 4 6 8 12 or 20. (note: some of them are highly unenjoyable to play with). However, none of them have solutions with equal size polygons, they each consist of a combination of at least two 'regular' polygons. Once again, with most of these I wouldn't enjoy playing around. How many different kinds of rings are there?